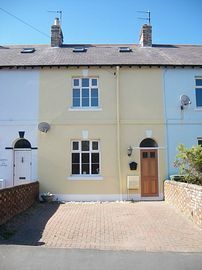 Located just about two minutes walk from Brewers Quay and Newtons Cove, Sailors Rest is sure to be a popular cottage; benefiting from parking and a large fully enclosed patio and grassed garden, along with a fantastic location, close to everything generally sought after when holidaying in Weymouth. The accommodation is deceptively spacious and includes a separate lounge and dining room and a conservatory styled seating area, which opens onto the garden. Nearby, you may choose to visit Newton's Cove - a favourite place to go rock pooling at low tide, or a short level walk of about 7 minutes will bring you past the pretty old harbour, over the town bridge and to the town centre, with a variety of High street names and individual quirky shops, located in the lanes off the High street. Adjacent to the high street is the main Weymouth Beach, which is favoured as it is long and sandy with shallow waters. Here children can indulge in entertainments long synonymous with seaside holidays; donkey rides and punch and Judy shows. For guests of all ages, a walk along the promenade admiring the Georgian esplanade, or just relaxing in a deck chair and enjoying the ambiance is also an option. Eating out in Weymouth is increasingly exciting. As well as arguably the best Fish and Chips shops in the region, you may sample cuisines from around the world; Spanish, Chinese, Greek and Italian. The harbour side restaurants serve freshly caught local fish and seafood including hand dived scallops. Travelling out for the day you may choose to drive along the world heritage Jurassic coastline, with stunning views and scenery, stopping along the way at pretty Dorset villages, such as Burton Bradstock or Abbotsbury to enjoy the hospitality of a local pub or cream tea from the village tea rooms. Accommodation: Lounge. Dining room. Kitchen with small conservatory area and patio doors to garden. 1st floor: Bedroom 1, twin single beds. Bedroom 2, Kingsize double bed. Bathroom, bath, with shower over, hand basin and toilet. 2nd floor: Bedroom 3, twin single beds. Services in addition to standard equipment: Gas central heating. DVD player. Washer-dryer, fridge, freezer. 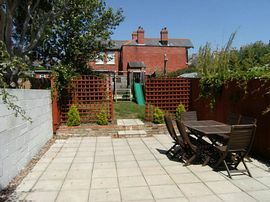 Good sized fully enclosed garden with patio, lawn and childrens swings-slide, garden furniture. Good sized enclosed garden with lawns and patio. Children's swing and slide and also garden furniture. Local Services: Near to the town centre and all ammeneties. Minimum Price: £396 and the Maximum price is: £863 plus all bookings have an £18.00 booking fee on top.